Classic executive pen sets branded by ePromos help continue the tradition of gifting commemorative, promotional writing utensils, and ours can be embellished with your special touch! Our high-quality pen sets feature finger grips for comfort and stability, handsome colors, and unique design options to match your brand's personality perfectly. Select from among our wide collection of ballpoint and rollerball pens today for a personalized thank you gift or reward, engraved with your business name, for congratulations on another successful campaign or quarter. Executive ballpoint promotional pen with a beautiful enamel finish makes this executive pen the perfect gift to show your appreciation. Executive roller ball promotional pen is a pleasure to have and to hold and makes the perfect gift to show your appreciation. Executive ballpoint promotional pen is a pleasure to have and to hold and makes the perfect gift to show your appreciation. Colorful brass cap/barrel promotional pen with unique rubber finish and black ink. When most people see the word “executive” describing a pen, they imagine an expensive pen that is way out of their budget. But if you look through ePromos selection, you will see that is not the case! These personalized items come in a wide range of prices and will make any recipient feel like a VIP. Any customer visiting your trade show booth will be sure to appreciate receiving a high-quality ink pen. Even if they’re not executive-level, they’ll sign their name with the confidence of one with these items! Give out the feeling of power and excitement with a branded executive pen. 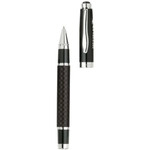 ePromos carries a variety of brands in our executive pen selection. Big names like Balmain, Cross, and Bettoni are just some of the options to choose from. Our selection of pens range from $2.00 up to $100.00! You will be sure to find the perfect option for your budget and style needs. Give the gift of a high-end pen and make a positive impression on your most valuable clientele. No matter which personalized pen you choose, your logo and branding will be sure to stand out. Our selection of writing instruments can be decorated in several different ways. A classic laser engraving on the barrel will create an expensive aesthetic and feel. You can also go with a basic screen print or full color process print to make your logo stand out. No matter which option you choose, they will boost your customers’ self-esteem! They’ll feel like a million dollars with any one of our custom high-quality pens. Our executive pens are shipped in a gift pouch and make wonderful gifts for sales associates, executives, or anyone in your business circle who needs a good quality writing instrument that’s durable and stylish. Order yours today!